Your vehicle uses many different fluids in order to properly operate. Each of these fluids is engineered to perform a certain function and needs to flushed and refilled at certain mileage intervals in order to continue to do their job well. This includes the transmission, brakes, cooling system, and of course the engine, which relies on engine oil for a number of things. If you don't change your vehicle's oil you run the risk of major engine problems that will no doubt be very expensive to fix. These are three reasons that you need to change your car's oil on time, every time. Changing your oil is the single most important thing you can do for your car to ensure it has a long road life. 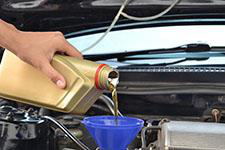 Engine oil is what provides all the moving mechanical parts within the motor the lubrication they need in order to avoid metal on metal friction. Without oil metal parts would grind on each other and the parts would quickly deteriorate, causing you to need a new engine or at least have major repairs performed. You engine operates at extremely hot temperatures. While the cooling system's main function is to keep the engine cool, fresh oil helps out as well. The oil is designed to absorb heat as it passes through the engine, but as the oil ages it loses its ability to do so and can actually reflect heat, causing a warmer engine environment. When old oil is drained from the engine it removes gunk and grime that has built up inside. This debris causes your engine to have to work harder than necessary to produce the same amount of power, thus lowering your fuel efficiency. Changing your vehicle's oil is mandatory if you want your car to last for many thousands of miles. Different cars have different intervals at which the oil needs to be changed so be sure to ask your mechanic how often your vehicle needs fresh oil. For an expert oil change in Covina come see the team at Hye Tech Auto. We perform all aspects of auto maintenance for all makes and models. You can rely on us to keep your car running great for years. To schedule professional auto maintenance in Covina give us a call at (626) 332-5452 today!